This looping movie shows the position of Mercury some 14 degrees above the eastern horizon one hour before sunrise as seen from Sydney, New South Wales from 26 April to 10 May 2018. The innermost planet attains a favourable elongation of 27 degrees west of the Sun on the last morning of April in Australasia, meaning that it can be seen in a dark sky before the onset of astronomical dawn throughout the period of this animation. For scale, the view is 80 degrees wide, or four times the span of an outstretched hand at arm’s length. AN graphic by Ade Ashford. Have you ever seen the closest planet to the Sun? If you wish to tick Mercury off your to-see list, particularly if you live in the Southern Hemisphere, now’s the time to be scrutinising the eastern sky shortly before sunrise for the planet’s rosy glow. On 29 April (30 April in Australasia), Mercury attains a greatest westerly elongation of 27 degrees from the Sun – just 4 percent short of the farthest it can ever appear from our parent star. Observing conditions for Mercury under southern skies are so good over the next fortnight (weather permitting) that skywatchers in Australia and New Zealand can comfortably view the planet in a truly dark sky from a viewing location that offers an unobstructed view of the east-northeast horizon about 1½ hours before sunrise. Mercury’s magnitude grows from +0.7 to zero over the next two weeks, but atmospheric dimming close to the horizon will make it appear up to a magnitude fainter. Even so, the innermost planet will be a conspicuous dawn object for Southern Hemisphere observers through to the middle of May. 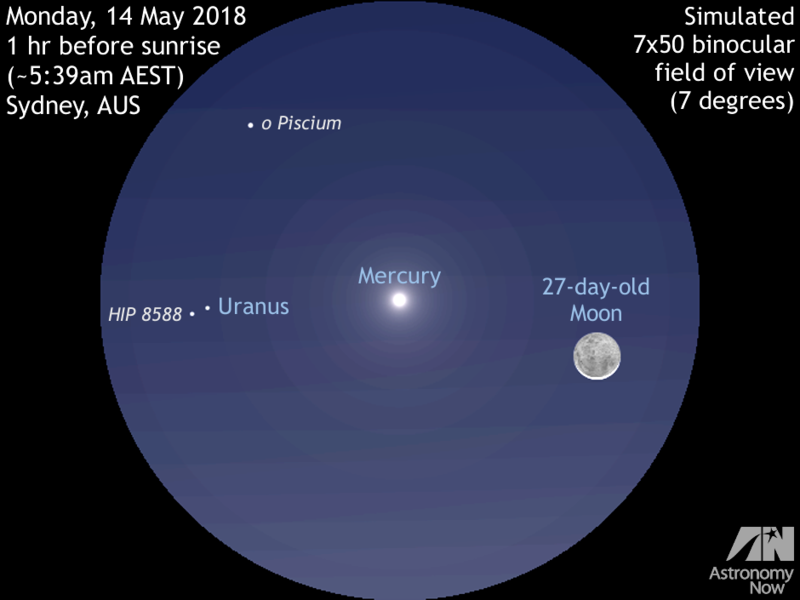 Observers in Australasia looking low in the eastern sky an hour before sunrise on Monday, 14 May 2018 can see an attractive conjunction between magnitude -0.2 Mercury and the slim crescent of a 27-day-old Moon in the constellation of Pisces. In this simulated seven-degree 7×50 binocular view from Sydney, New South Wales, there’s the added incentive of glimpsing magnitude +5.9 planet Uranus in the same field of view. Uranus lies just over the constellation border into Aries, one-fifth of a degree from a similar brightness star known as HIP 8588. Don’t confuse Uranus with magnitude +4.3 star omicron (ο) Piscium above in the same binocular field. AN graphic by Ade Ashford. Mercury crosses the constellation border from Cetus into Pisces on 1 May and has a close encounter with an old crescent Moon on 14 May. On this date, observers in Australasia should look low to the east-northeast horizon an hour before sunrise to see the 27-day-old Moon just 2 degrees to the right of the magnitude -0.2 planet. 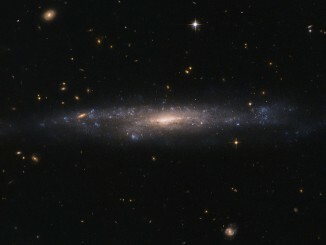 Small telescopes and binoculars magnifying 20× or less will show the pair in the same field of view. And as a bonus for owners of binoculars, magnitude +5.9 planet Uranus also lies 2¼ degrees to the left of Mercury on this morning! 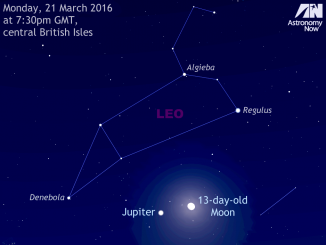 As darkness falls, observers in Western Europe and the British Isles fortunate to have clear skies can view a naked-eye conjunction between largest planet Jupiter and the Moon. For telescope owners, Jupiter’s Great Red Spot will be on show, while Galilean moons Io and Europa partake in a close orbital dance. 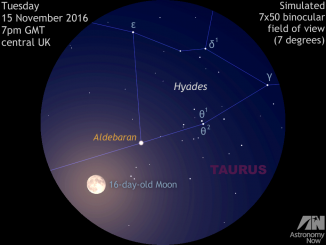 As dusk fades to dark on the evening of Tuesday 15 November, observers in the British Isles and Western Europe can see the rising 16-day-old Moon less than 2 degrees away from Aldebaran in the constellation of Taurus. While an occultation of the star occurs around 17h UT for observers in Japan, central Asia and the Middle East, skywatchers in the UK will have to settle for a near miss.